Currently sat at home waiting for a BT engineer to turn up and sort out my broadband… again. Since getting BT Broadband in October we’ve had loads of problems with it, BT Vision not working, an 8MB line coming in at 104kbps. All this lack of actual service is further compounded by their customer service. A call to phone them up normally results in a 40 minute wait and no real answers and a promise that someone will call you back in 24 hours – to their credit they normally do, but more often than not the call results in “I can’t do that, I’ll have to refer you to X who’ll call back in 24 hours… Grr…. Doomed I tells ya…, originally uploaded by markhassize11feet. It was destined to be a bad day. 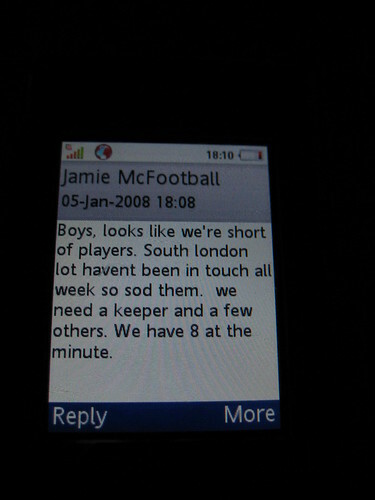 Got this message on the evening before the match. Ended up playing in goal, got sent off after 10 mins for throwing a ball at someone’s back (in theory this should’ve been a yellow card, but the ref deemed it violent conduct, so it was a red). 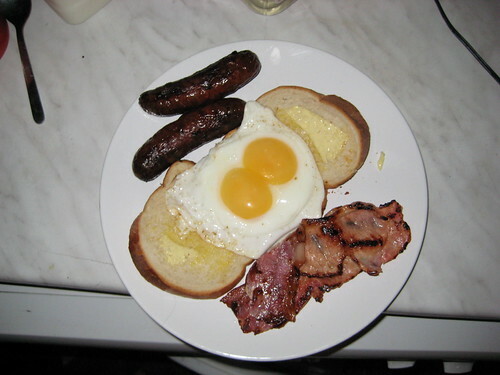 Double Yolker!, originally uploaded by markhassize11feet.